In his painting Rosenquist used the techniques developed in his commercial work. Drawing deeply on the iconography of advertising, his art was deeply influenced by the contemporary industrial and consumerist culture of the time. In a series of monumentally scaled paintings Rosenquist rendered in an illusionistic photographic- like style, a juxtaposition of unrelated “pop” images in garish colours. In his print ‘Somewhere to Light’ Rosenquist appropriates, to our eyes, a quaint piece of sixties advertising. The words ‘Waco, Texas’ appear within the halo of the circular fluorescent, and the image is overlaid with baby blue and pink colours. 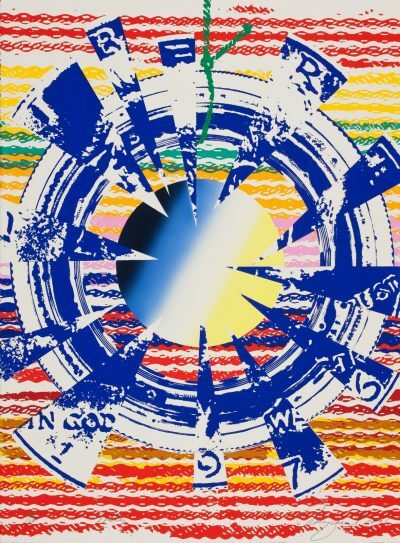 In common with his painting Rosenquist’s print is located in the sixties zeitgeist of the iconography it appropriates. ‘Somewhere to Light’ is one of ten prints which make up the New York International Portfolio. Published in an edition of 250 by Tanglewood Press in 1966, this was a ground-breaking print portfolio which quickly became a model for printing practice and was especially influential in the marketing of prints. Originally acquired by Senator Gordon Lambert this portfolio, number 111 in the edition, was donated to IMMA in 1992.